In 1797 Lt William McPherson Rice charted a submerged reef approximately 1½ nautical miles off shore, north of Cape Recife. He named it Dispatch Rock and noted that it lies only 3m below the surface at low tide. This rock was a peril to many a ship and in 1838 a lit marker buoy was anchored over the reef, but it was soon washed away. In 1843 another buoy was placed and an official notification was placed in then Government Gazette naming it Roman Rock. Today an East Cardinal maker buoy warns ships to past on the eastern side. At night a flashing light marks the location of the reef. 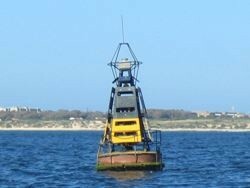 There is offcourse a bell on this buoy to warn ships when fog rolls into Algoa Bay, hence the name Bell Buoy. 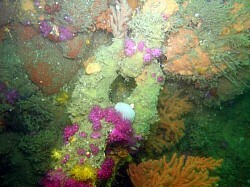 This extensive reef covers a large area, with lots of pinnacles and gullies to explore and can not be covered in one dive.